Imaginary Homelands is both a thematic framework and a strategy for exhibition-making, written in both Spanish and English. It is the culmination of a three-year experimental residency project that explored how the oscillation of people, ideas and materials between the two places—in this case Bogotá and Toronto—could become a point of departure toward ‘locating’ a fictionalised mid-way point. A product of this experiment, the exhibition is an imaginary place conceptually situated somewhere between the two locations, made tangible through a series of artworks created specifically for, and as, an “imaginary homeland” at Art Gallery of York University. 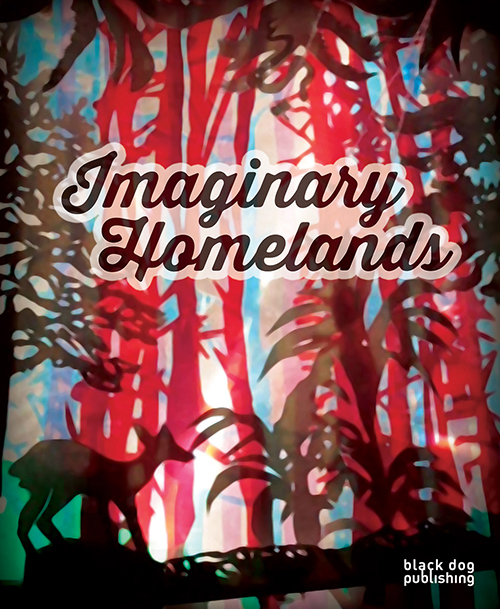 Imaginary Homelands collates artwork from a series of residencies. Artists considered their projects from the position of being in and from the two locations simultaneously, allowing both to inform their experiences, inflect their understanding of ‘the local’ and provide differing social and cultural contexts, available materials, etc, for the development of their work. As hybrid creations that draw upon and from many different sources, materials, stories and experiences, the resulting works in Imaginary Homelands are more than just translations. The exhibition literally and figuratively crosses borders and boundaries—both actual and perceived—which its works annul by proposing new insights from the perspective of being in a place that is neither here nor there. Contributions include work by Carlos Bonil, Nicolás Consuegra, Miler Lagos, Mateo Lopez, Mateo Rivano, Maria Isabel Rueda, Daniel Santiago, Angélica Teuta and Icaro Zorbar. Designed by Lisa Kiss. Major essays by Emelie Chhangur.